Facebook is a well known and popular social networking site launched in February 2004, owned and operated by Facebook Inc, has over 900 million active users, Facebook has achieved many milestones and has its impact on every aspect of our lives from social, cultural to political. Facebook is built as one monolithic application in PHP but a specific source code transformer (known as HipHop) built by Facebook engineers converts it into C++, this helps reduce average CPU consumption of Facebook servers by 50%. Maximum number of users in USA, followed by India, Indonesia, Brazil and Mexico. Facebook has turned into an industry of a kind directly and indirectly providing employment to many. Looking at this rising trend Brainmeasures (an ISO 9001-2008 Certified) online certification company has launched a Facebook Certification to cater to this growing need. This Facebook Certification course program is an all inclusive study material to help you learn and master Facebook development tools, developed by experienced professionals under strict ISO controls this is a one of its kind Facebook Development course available. 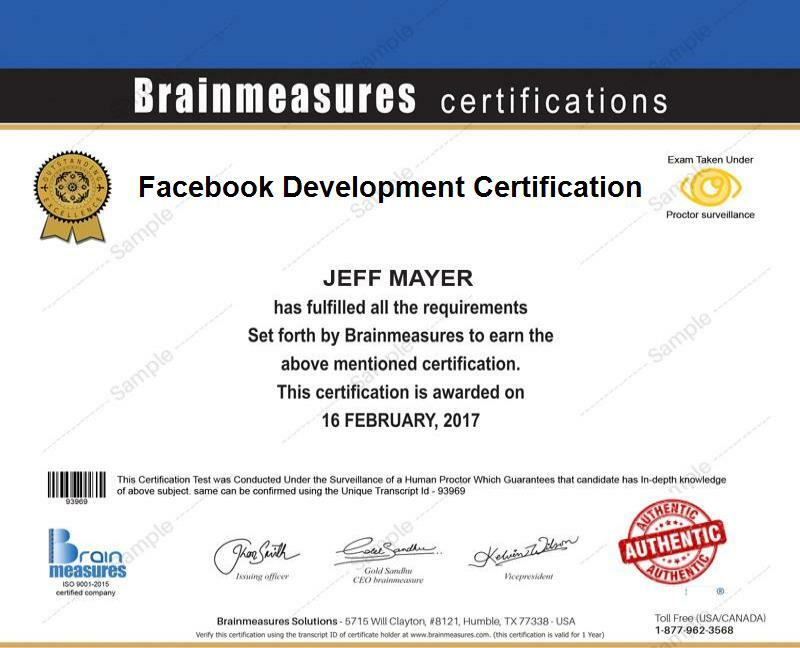 Brainmeasures Facebook Certification Package consist of a full-fledged Facebook Development course material, Facebook Certification exam and Hard copy Certificate. This Facebook development course material is an intensive study guide touching each and every aspect of the subject. This Certification course has been divided into five parts to help you absorb and understand the subject with ease. Section three will help you manage and organize your Facebook page. Section five will help you use Facebook creatively by discussing commonly used Facebook applications. Note: To view detailed syllabus please registers with Brainmeasures and if already a member just sign-in your account. This course has been developed in such a format that anybody who is interested in learning this subject can enroll for this certification program, no prior knowledge is required for enrollment. This course is very beneficial for any new user of Facebook and forms an excellent study guide for those who want to use Facebook for business purposes. Certified professionals are in huge demand and this field is no different, if you are a certified Facebook developr you can work in internet marketing firms, website marketing managers, freelance web page marketing manager and many such related fields. Certified Professionals are highly paid and earn huge monthly salaries and with growing internet business opportunities this sector is growing at a rapid speed. Web marketing has become a huge sector and web marketing managers get huge salaries ranging from $30,000 to $1, 00000. Big websites hire their private marketing teams and pay them whooping salaries, so if you plan to become a web marketing manager this is the best time to enter this industry.